Physics is the study of the elemental constituents of the universe. It deals with matter, energy, forces, space and time. In the long history of physics, a series of discoveries and laws laid the foundation for how the universe works. In Core Physics these discoveries and laws are laid out in chronological order, each naturally building on the former. 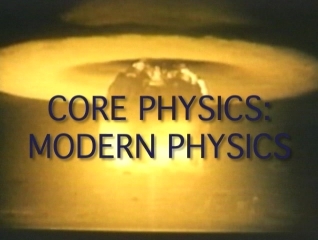 People study modern physics and physics. 00:03:00The atom is made up of subatomic particles, the electron, proton, neutron and nucleus, and were discovered by J.J. Thompson and Ernest Rutherford using a cathode ray tube. 00:03:58Quantum Theory or Quantum Physic or, quantum mechanics, was invented by Max Planck, who gave the world electrons, protons and neutrons. 00:04:50Chaos Theory was invented by Benoit Mandelbrot introducing fractals and the butterfly effect. 00:05:01Special Relativity and General Relativity, were theories created by Albert Einstein in which he defined the speed of light and produced the formula E=MC2. 00:05:19Wave-particle duality and the uncertainty principle are part of Quantum Mechanics created by Neils Bohr, Werner Heisenberg, Victor de Broglie, Erwin Schrodinger and Paul Dirac. 00:03:15E=mc2 was the formula that allowed man to produce Nuclear fission, atomic bomb and nuclear reactors. 00:03:04Quarks and neutrinos are part of sub-atomic particles discovered by Murray Gell-Mann, and explained Stephen Hawking and superstring theory.